The simple answer to this question is - I feel called to wear a veil. I first felt the call to wear a veil in the presence of Our Lord in the tabernacle while in college in 2004. At the college Newman Center I attended, no one else wore a veil. The call was so strong, I went out to Joann Fabrics and bought some lace material in attempt to make my own veil. 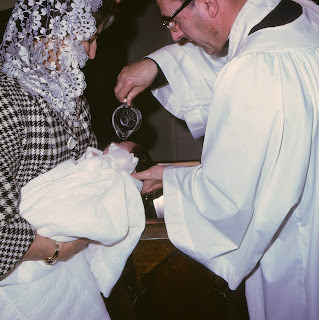 I was the peer minister of liturgy at the time, so it occurred to me that I should ask the campus minister for permission to wear a veil. He was concerned that I might intimidate the other students and recommended against it - to my great relief. I'm not one for seeking attention or standing out in a crowd. I put the fabric aside and did my best to silence the call in my heart. Years passed. I moved, got married, and attended a different Catholic church. I still felt the call deep down, but couldn't shake the desire to not draw attention to myself. 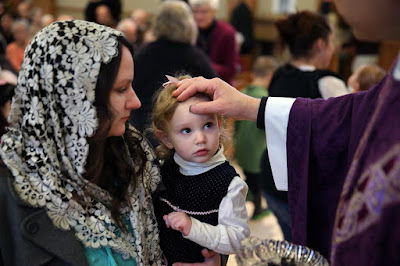 To my surprise, a small group of women at the church began to wear veils. It encouraged me, but the thought of it still made me nervous. Another encouragement for me was that I saw a picture of Michelle Obama wearing a veil in the presence of the Holy Father. I thought, "if she can wear a veil out of respect for the Holy Father and the Church, then surely I can too - out of reverence for Our Lord in the tabernacle. In October of 2011, 6 years ago, we were anxiously anticipating the birth of our second child. With our first child, I was overdue and induced on the 9th day after the due date. This time around, I wanted to avoid being induced. Finding myself overdue again, my doctor agreed that I could wait up to 14 days before being induced. So we waited and waited. I was very worried and had no idea what to expect. On the night of the 19th, I had a very vivid dream - Andrew and I were in a church kneeling in the front and he was praying the rosary beside me. I was wearing a veil. I looked up and saw a priest sitting in the presiders chair. The priest was speaking to us, telling us that everything would turn out alright and to trust in God. The priest turned out to be Pope John Paul II! When I woke up I cried and knew two things. The first was that Peter would be born in three days, on October 22, 2011 - the first celebrated feast day of John Paul II (and he was!!). The second thing I knew was that I shouldn't put off the call to wear a veil any longer. I always felt very close to St. John Paul II while he was a live, and after his death. In my dream, I felt that I appeared as I should be - under a veil. St. John Paul was encouraging me to respond to God's call. Since having that dream, I began wearing a veil. I always wear it in the church (unless I forget to bring it...). It felt strange at first, but I gradually became used to it. I don't feel like I stand out. I worried that others would judge me and think that I think I'm so holy. But I don't feel that way at all. The veil humbles me. Now I'm so used to it, that if I forget to bring it, I feel naked! Others have written or spoken about theological reasons to wear a veil. I especially enjoyed this blog post from Jennifer Fulwiler. I have no new information about that for you. Just simply that I wear a veil because I felt the call. A couple of years after I began wearing it, my mother-in-law gave me her mother's old veil. What a treasure! I never got to meet Grandma Reilly, but I think about her when I wear the veil and it makes me feel close to her. After six years of wearing a veil, and in particular wearing Grandma Reilly's veil, I wonder how many baptisms, weddings, ordinations, and funerals this veil has witnessed. How many tears have the tattered ends wiped away? I know it has caught many of my tears! Wearing this veil brings continuity to all the Masses I have attended. It is an unchanging garment that elevates my thoughts to eternity.